We are thrilled to announce that we will be hosting quilter and teacher Amy Garro for a weekend in June. 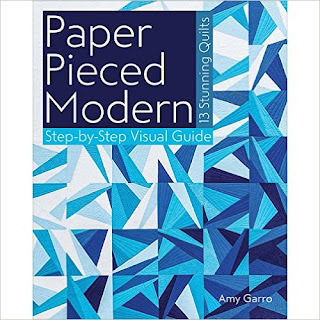 Amy blogs about her creative journey at 13 Spools and released her first book last year: Paper Pieced Modern. On Saturday, June 11, Amy will be conducting an intermediate-level paper-piecing workshop at Quilted Threads in Henniker, NH. This all-day class will focus on sewing Icy Waters, the quilt design featured on the cover of Paper Pieced Modern. Cost for the event for members is $100/person and includes lunch. (Participants are also required to own a copy of Paper Pieced Modern. We will be placing an order for books in the spring.) You can sign up for this event at the February guild meeting. Then join us on Sunday, June 12, for an afternoon trunk show with Amy at Messiah Lutheran Church in Amherst, NH. Participants will be encouraged to view Amy's designs up close at this event that will feature 15 of her amazing quilts. Admission for this event for NHMQG members is free. Admission for the public is $5/person. We hope you'll join us for these events. Amy's signature designs and free-motion quilting are exceptional. The weekend is sure to be both educational and inspiring! Thanks a lot for sharing these details regarding June Events. Will definitely attend one of them. The best thing is that these events will be organized at local event venues quite near to my home. Keep sharing updates!